Old friends of mine are quite aware of how big of a Duran Duran fan I was growing up. I saw my first concert in February of 1984 and I have seen them countless times since. Every dollar I had growing up I spent on concert tickets, books about Duran Duran and music magazines - and they were mostly British magazines, like Smash Hits, that I would special order. Every INCH of my bedroom walls were was covered with Duran Duran posters, pictures, memorabilia, etc. Throughout the 90s and 00s, I met the band several times and it was never a good thing. 1) I get horribly embarrassing around famous people and behave like a moron. For example, once I was back stage at some summer festival show and I met John Taylor. I stood there and stared at him and could not utter a word. Finally, the only sentence I could come up with was, "All my pin numbers are your birthday." I was creepy and weird. 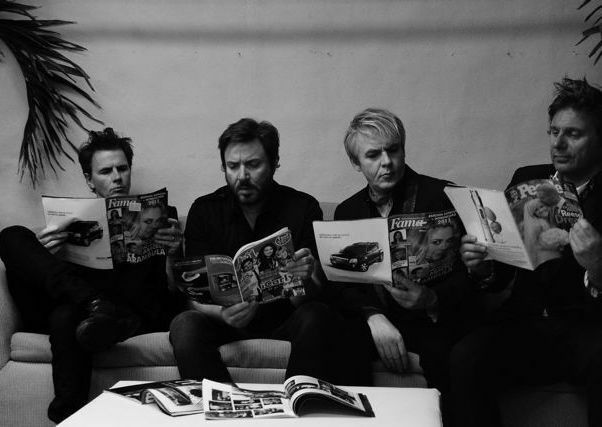 And 2) no matter how cool/awesome/amazing the members of Duran Duran may or may not be, they can NEVER compete with the image I have of them in my mind; therefore, they are destined disappoint me and it is best they remain a fantasty. So... How Was The Show? Obviously, I am going to say "IT WAS AMAZING!" because they could get up on stage and play Mary Had a Little Lamb and I would think it was the best thing that ever happened. But, the show was really good. Really, really good. 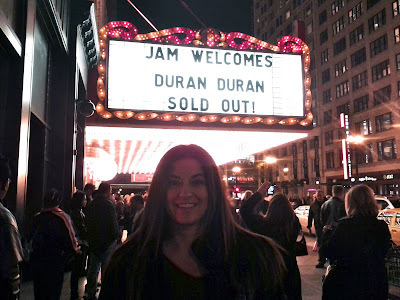 After missing the House of Blues show back in April, I made sure to buy tickets to the Chicago Theater show - especially because I love seeing concerts at The Chicago Theater. I invited my high school boyfriend with me to the concert - to throw a bit more nostalgia into the mix. I really liked the energy of the show. The selected songs, though not all my favorites, were mostly high-energy, pop songs that were thoughtfully organized. 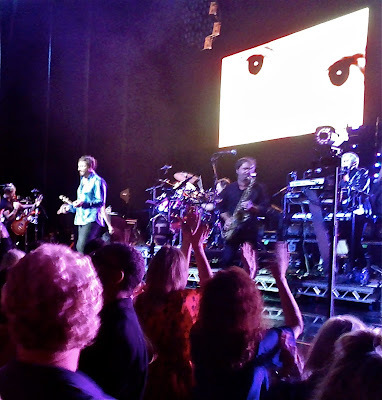 Duran Duran opened with a new song, Before the Rain, that starts slowly with sounds of string instruments, it is a melodramatic song about broken promises and murdered secrets. Before the Rain created a sense of mystery on stage as the band appeared. Next, they burst into an upbeat version of Planet Earth. To be fair, this is where I lost my mind and I recall very little from this point until they played Is There Something I Should Know (which is fantastic live and they almost always play it live) and I woke up from my happy haze in time for the "Twitter Break". About half way through the show, John Taylor got on the mic and gave a "shout out" to all the Twitter followers. Next, the band moved aside and a Live Tweet screen was projected on stage. All the tweets using the #DuranLive hashtag, the "official" Duran Duran Tour Twitter hashtag, were displayed as the song Tiger Tiger (an instrumental from 7 And The Ragged Tiger) played. This was exceptionally pleasing for me as I started to Tweet frantically and insisted that Ryan keep is eyes peeled looking for my name to come up on the screen. Careless Memories - one of my all-time favorite Duran Duran songs - mostly due to the angry, jilted lover lyrics. Notorious - I was happy they played one song from the album Notorious since it is one of my favorite Duran Duran albums (Skin Trade being my favorite song) but I think Notorious fit best into the very pop-centric set list. (Reach Up for the) Sunrise - this was the second time I had ever heard this song, it is from the new album, and it was a great way to close the show. It was so fun and inspirational! They didn't play Friends of Mine - from their album Duran Duran, I wished they had played this song. Duran Duran played this in '01 at the House of Blues and did a fantastic job live. They didn't play Secret Oktober - I saw some tweets from other fans wishing they had played Secret Oktober which appeared on the Union of the Snake Single and 12" B side. Every die-hard Duranie wants them to play Secret Oktober and they rarely ever do. I wish they had not played so many obvious "hits" - they played Reflex, Hungry Like the Wolf, Wild Boys, Rio and A View to a Kill. They could have also skipped Ordinary World, but this must be a special song for the band, they always play it. With lyrics like, "I won't cry for yesterday, There's an ordinary world somehow I must find" and the timing of the release '93 (the absolute downfall of their career), I can't help but think there is a correlation. Actually, on second thought, I take it back, this is a great song, I'm glad they played it. Like a big idiot, I made the biggest amateur mistake and did not select seats on THE LEFT. John Taylor always stands on the left side of the stage, I know this! I barely got to see JT at all! 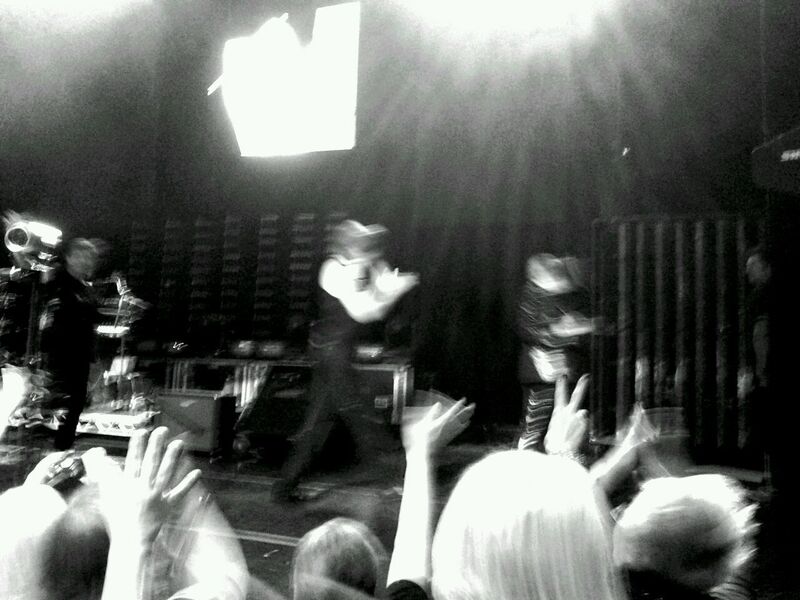 I was finally able to snap ONE picture of him as he left the stage, it is in black and white because it is a terrible photo.